Firstly a big thank you and well done to the first participants in our DNA testing scheme. The first results are back Mike Gilchrist and Neil Croft are working feverishly in the background on preparing the public register. Just to remind everyone we are offering DM testing using DDC with whom we have negotiated a discount which means you can get your puli tested for the all in sum of £32 per puli for HPC of GB members and £37 per puli for non-members. Neil and Sue Croft will be at the following shows (more dates to follow) and they have got plenty of test kits available so please come along and see them. If you can’t make a show, contact Neil directly (Neil@kistelek.co.uk). A few weeks that changed my life…. Hello my name is Luna and it’s been a crazy few weeks. 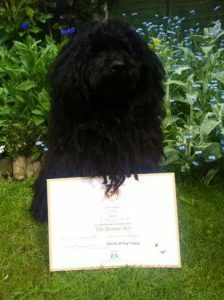 My life as a Puli was happy and stable and then my owner was taken ill. Before I knew what was happening I woke up to find myself at the Dogs Trust Hotel in Harefield. The staff there are very nice but it wasn’t like home and I knew I needed to find some humans to adopt as soon as possible. My friend Miranda at Hungarian Puli Club of GB Welfare was on the case and she knew of a lovely couple who they had helped before. 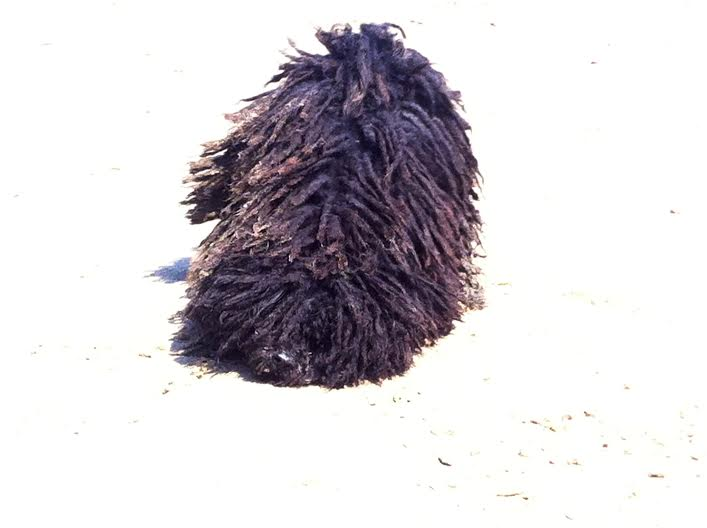 They already had a Puli called Ziggy so I thought it was worth meeting them all. They came down to Dogs Trust to see me and we just clicked. I knew it would be worth adopting them, as they already seemed Puli trained. My new friends at Dogs Trust said they could take me home so I packed my lead and off I went. I have been with them for around six weeks now and am setting in well. I am getting lots of walks and fuss. Their other Puli Ziggy is my new best friend and we are playing in the garden and running around. He is helping me settle in and showing me the things he can do. He has also helped me find my voice again and it seems to be working better than ever. I am eating and sleeping well. All the playing and walks are making me happy as you can see from my photo below when we all went to the beach. I have been to my new vets and they gave me a clean bill of health and added me to their computer so now I cannot escape my boosters. I have even been made to go to school where I have already passed my Good Citizen Bronze level. I would like to thank my friends at Dogs Trust and I hope all the other dogs are finding new homes like I have. Thanks also to Miranda at Hungarian Puli Club of GB Welfare for alerting my new family and to Melissa at Strictly K9 Dog Training for teaching my humans well. P.S. My humans Russell and Sandie wanted me to tell you that they couldn’t be happier that I was willing to adopt them! Special thanks to Miranda Turrell at Hungarian Puli Club of GB Welfare and Daniel Thompson at Dogs Trust who alerted them to my situation and facilitated our first meeting possible. They thank you all for your help and look forward to many happy years living with me! They keep telling me I am a fantastic dog and who am I to argue!